Rekeying VS. Getting New Locks? We get this question all the time? What is the difference between RE-KEYING and REPLACING locks? Well, the simple explanation is that REKEYING a lock uses the same housing (hardware) of the lock and just changes the pins that are inside. A standard house lock has 5 tumblers or ‘pins’ and each pin has between 9-10 different sizes. So the odds on your key opening up another random house lock is about 1 in 100,000. If your lock has 6 pins instead of 5 (with each one having 10 different depths to it) then the odds are now 1 in 1,000,000. Pretty rare, indeed! When a locksmith rekeys your lock and the pin configuration is changed, the old key will no longer work and the new key that your locksmith gives you will be the only one that can unlock the lock. REPLACING the lock is just as the name implies. The old lock is removed from the door and a brand new lock takes its place. New everything! Brand new shinny lock and of course, a completely different pin configuration. There are many factors in deciding which method works best in terms of getting an old key to ‘not work’ and a new key to replace it. If you have many locks (of the same brand) and want the same key to work in all of them (instead of having several different keys), then rekeying them will accomplish this. If you have a house with several locks of different brands and want just a single key to open them all, then replacing the locks is probably a better way to go. Having said the above, the number one difference between the two methods is price. 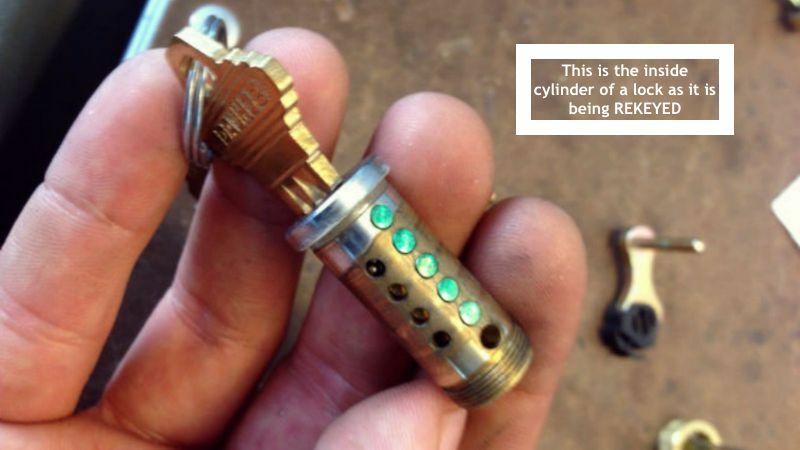 It is usually cheaper to rekey a lock – then to replace it. However, there are other factors. Is your lock a cheap lock? Is it older than 15 years? If you have a cheap lock(s) and they are older then 15 years, just replace them. Locks do not last forever. So…simply stated…If you have a need to ‘retire’ an old key and not have any copies work in an existing lock…just replace the lock if the original lock was a ‘basic’ or ‘cheap’ lock AND it is old. The price difference is negligible. If you have expensive locks and are looking to make sure that all old keys DO NOT work anymore and want only a new reconfigured key to work…then go for a REKEY of the lock(s). Also, make sure you check out our info on rekeying scam so your are armed with information so you can be an educated consumer. See our Known Locksmith Scams Page HERE.